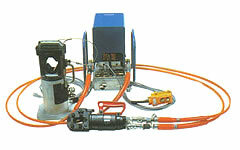 EP-60D Hydraulic Compression Tools: Izumi Products. The EP-60D is a double acting 60 ton press. The benefits of this are fast ram retraction and elimination of the possibility of the tool jamming. Double acting means hydraulically advancing and retracting the ram. 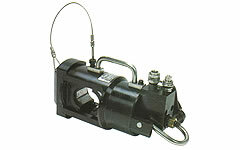 A 4 way valve reroutes the hydraulic path to the retracting chamber. This will ensure the ram will retract hydraulically. As a result, the possibility of connector jamming is eliminated and at the same time the ram is retracted much faster. Ram retracting time is 1/3 of spring return EP-60S. Steel carrying case, ground stand.